I was on the water early in hopes of finding that the crappie were biting at daylight. With a big storm rolling in later in the day, the odds seemed to be in my favor. With holes punched in the dark, I was really for some action. The sun was coming up and I knew that I was in a spot that the crappie were using. The bite started slow and I found that most of the active fish were bluegill. I sat in one hole that was constantly flooded with fish. The sight fishing was tough until the sun was bright enough to shed some light under the ice. Using my camera, I found that there were small and medium crappie but they couldn’t compete with their competition. 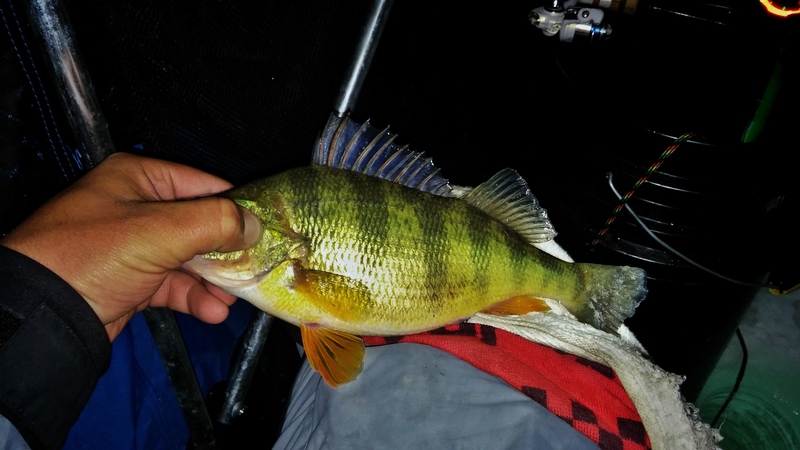 After 2 hours in the hole, I had caught a ton of bluegill, some big perch, and a bass. Although I gave up my morning to a spot that I had been fishing for a while, I had intended to dedicate the rest of the day to exploring new parts of Lapham’s Bay. Using Navionics and Google maps, I highlighted a few locations that I thought looked ideal to funnel fish. The walk seemed long as the snow at this point was coming down so hard that I couldn’t see across the bay. Arriving at a slowly sloping point coming up into a shallow flat, I started punching my holes on the deep end. 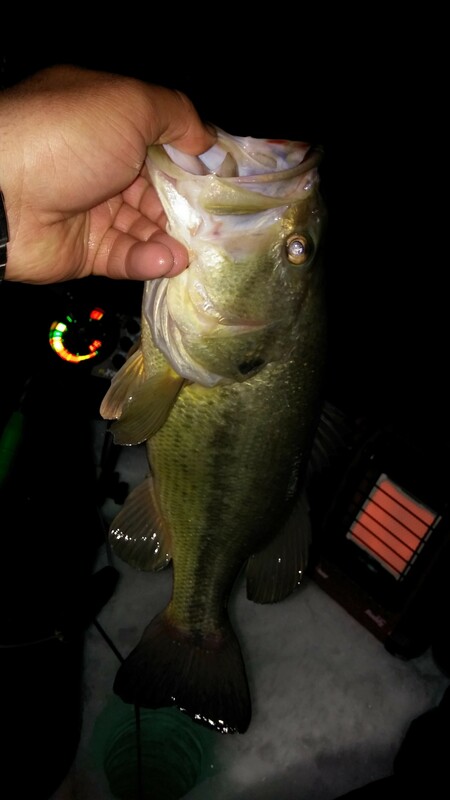 I figured that the bite would get better the shallower that I got. As expected, I found a sandy slope leading up to some good looking milfoil starting in 6 feet of water. Again I found plentiful amounts of bluegill and perch but no crappie. At this point in the day, I had pretty much stopped fishing and was spending all my time searching with my camera. The fish were relating to weeds and were not scared of the camera. After working through a large section of new water, I decided that getting on the road before conditions got much worse. Previous Post2-17-14 – Crappie In The SlopNext Post2-19-14 – They’re There But Won’t Bite!